Become a garden anarchist: “Call it boot camp, and not all volunteers make it” by Barbara Damrosch, “A Cook’s Column,” March 8, CLICK HERE. The weed that’s been shooting at you: “Seedpod with a hair trigger” by Patterson Clark, “Urban Jungle,” April 10, CLICK HERE. 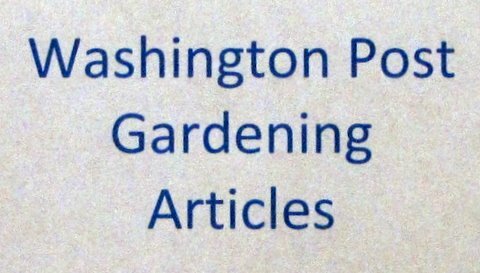 How to toughen up your veggie seedlings: “Preparing your little seedlings for the real world” by Barbara Damrosch, “A Cook’s Garden,” April 12, CLICK HERE. Kale—right and wrong: “Snow, sleet and kale—a wintry mix” by Barbara Damrosch, “A Cook’s Column,” March 22, CLICK HERE. What the shouting is about: “How scientists manipulate the genetics of crops” by Brian Palmer, “How & Why,” March 6, CLICK HERE. Why flowering pears are sprouting everywhere: “Pretty tree going rogue” by Patterson Clark, “Urban Jungle,” March 20, CLICK HERE. Note: Article headlines above are from the Post print edition. Online Post headlines may differ from these, but the text of the article will be the same. Great articles Bob. I especially like the kale and gene article.